Should I hire a plumbing contractor or my nephew? Hello there, Austinites, and welcome back to the best plumbing blog in the entirety of the United States. Mojica Plumbing & Drain Cleaning is dedicated to our clients on and off the clock, and we want to make sure that their plumbing systems are running as optimally as possible. As Austin plumbing contractors, we find it very important to stay up to date with our licensing and certifications. It’s our priority to not only make our clients feel comfortable with who is working in their homes, but to also keep all of our employees safe. 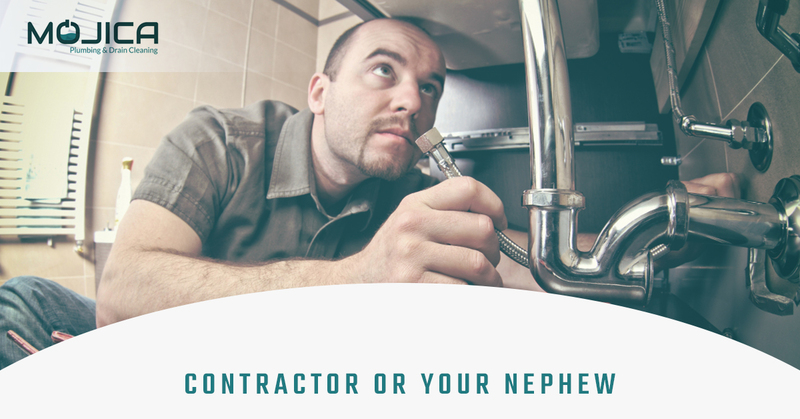 There are a few things that we recommend hiring a professional plumber for, and a few things that could be left to your nephew who needs a bit of cash. If you’re not entirely positive, then you’re in the right place. If the drain in your sink or shower just isn’t letting the water flow through properly, it’s probably clogged. If the problem is caused by some hair or debris that’s stuck at the surface, you could probably hire your nephew to come and fish it out with a coat hanger. However, if that doesn’t seem to be working, or if this is a recurring issue, it might be in your best interest to contact a plumbing contractor. We’ve said it before and we’ll say it again: do NOT use chemical drain cleaning products to flush out the blockage. Not only could this wreak havoc on your drains, but it can also cause serious health issues if used improperly. Drain cleaning is in our company’s name, and we’d be more than willing to help you out in a safe and efficient way. Additionally, we also specialize in Bio-Clean applications, which can prevent future blockages. There are a few reasons why the water pressure in your kitchen or bathroom could be slow and it’s difficult to diagnose these issues without the proper tools. As plumbing contractors who are constantly on the move to work with the latest and best technology, we’ve trained ourselves in the art of video-inspections, which are a quick and simple way to diagnose common plumbing issues, like low water pressure. The issue will likely stem from buildup in the showerhead or faucet, which can be fixed with a quick replacement. Unfortunately, it could also come from issues with the pipes, which could warrant a new pipe installation. Luckily, we’re pros in that area and can get your shower back up to par in no time. Sorry, but you probably don’t need to call a plumbing contractor to unclog the toilet for you. Usually, a plunger will do the trick. However, if this is a recurring issue that doesn’t seem to be attributed to poor eating habits, you can give us a call. Sometimes, the toilet or pipes might be outdated and might not be handling waste and water effectively. In this case, Mojica Plumbing & Drain Cleaning can assist you with a new toilet or pipe installation! Solution: Don’t call us, or your nephew. Perhaps consider animal control for this one! Yikes, so a snake came in through your drains? What a thing to happen. We know one thing for sure: don’t call us! We’re plumbers, not snake charmers. Maybe call animal control for this one, and make sure to document it for social media purposes, of course. Unfortunately, leaky pipes aren’t something that can be repaired with some duct tape, unless you’re in the mood for a bigger problem down the road. Leaking pipes can cause water damage to the affected areas and lead to bigger issues like mold and rotted flooring/foundation. It’s best to have your pipes either repaired or replaced as soon as you notice that something is wrong. Plumbing issues aren’t always the most pleasant issues to deal with, but Mojica Plumbing & Drain Cleaning does our best to make sure that everything is in order and working optimally. If you’re in need of any of these services, please contact our plumbing contractors here in Austin soon!